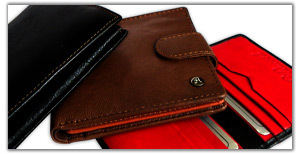 Our luxury men's leather wallets come in a range of different exterior and interior colours: black, brown, tan. They are durable and resist scratching, while remaining flexible and comfortable inside a trouser or jeans pocket. Larger sized travel organisers and small lightweight credit card holders are also included in the range. Each men's leather wallet is delivered in a gift box.